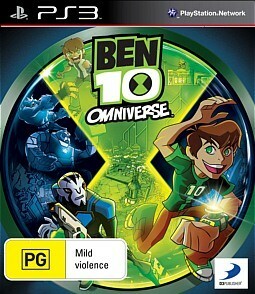 Ben 10 Omniverse PS3 Review. Omniverse is basic gaming in every sense, which isn’t to say that younger Ben 10 fans won’t enjoy the colourful characters, easy progression and co-operative play. Older gamers will tire of it quickly. 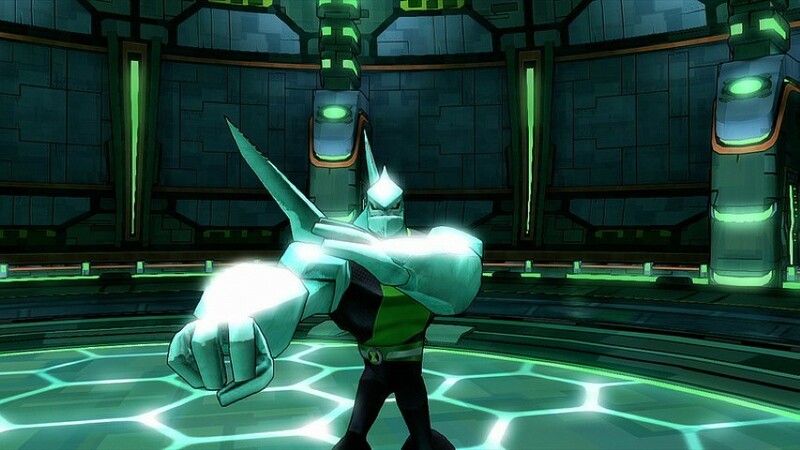 The best game I can think to compare Ben 10: Omniverse to would be Gauntlet. Because that’s what this is: A gauntlet of narrow corridors for you to stroll through, while enemies continuously spawn within comfortable range of your mutated fists. The action takes place across two timelines, and has you controlling both the original Ben Tennyson, and his sixteen-year-old incarnation from the later cartoons. The main villain here is Malware, an alien who can absorb various forms of technology to enhance his own powers. Although you control Ben, the story is actually driven by his new sidekick Rook, who continually switches between the timelines. Ben’s aliens have heaps of personality, thanks to the game’s cel-shaded visual style and the individual dialogue. Bloxx is a colourful lego gorilla who can shape himself into a container for Rook to push around, or act as a bridge between two platforms. Heatblast and Four Arms throw cheesy one-liners around as they fight. Although it’s a brawler in the tradition of countless beat-em-ups before it, the peculiarities of the Ben 10 universe do add a small amount of strategy to the combat. You’ve always got to keep an eye on the energy level of your omnitrix, which depletes with every attack or special move you perform. When this runs out you’re transformed back into Ben, who talks a big game but is essentially useless in combat. While in this unaltered state, you’ll be more vulnerable and your attacks won’t carry nearly as much weight. 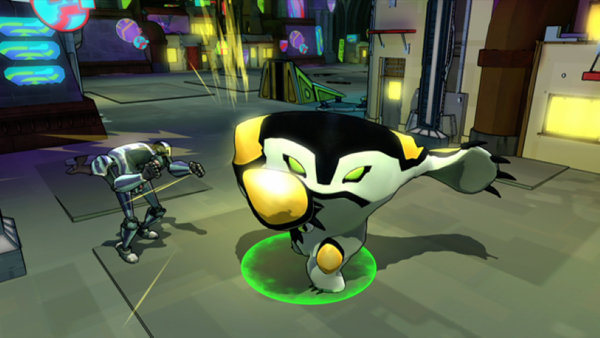 Some aliens, like Gravattack, can dole out huge damage at the expense of draining the omnitrix very quickly, and are best reserved for a heated boss battle or a swarm of tougher enemies. Some aliens have ranged attacks, or can double-jump, or just have cool attack animations, meaning there’s at least some incentive to try them all out. 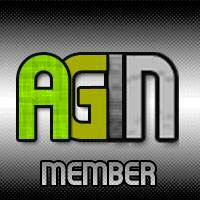 Over the course of the game you’ll earn experience points which can be spent on any one alien. Levelling them up means you’ll unlock new combos or be able to string more attacks together, making them much more fun to play as. 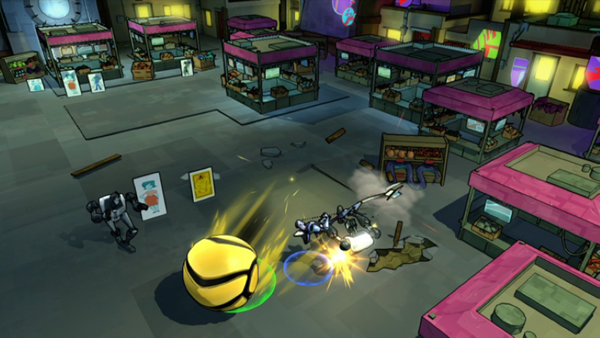 Ben 10 Omniverse is meant to be played in co-operative mode. There are always two characters on screen, but if you don’t have a friend next to you on the couch then control of Rook is taken over by the AI… and this is generally a very bad thing. Be prepared to spend a lot of time waiting for your greyish alien sidekick to re-spawn, as he inevitably misses every jump, lands in every lava pit and steps on every electrified grate. Of course a second human player alleviates this, but there’s always going to be an argument over who gets controller 1. While Rook has a few different weapons, it’s small compensation for Ben having a menagerie of powerful aliens to choose from. Aside from the constant fighting, and maybe in an attempt save your controller’s X button from being pummelled into oblivion, there are a few puzzles to contend with. These are very lightweight, and usually involve using one of your aliens’ powers to electrify a dormant power source, or sniff out some hidden footprints. Unfortunately, rather than being allowed to experiment with your various abilities, it’s almost always pointed out to you exactly what you need to do in these situations. Particularly bad are the jumping sections, which take place between rapidly moving platforms. The game’s double-jump feels dicey, and you always feel it’s due to luck more than skill when you pull off a tricky jump. 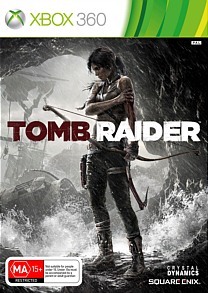 It feels like a cheap way of artificially raising the difficulty in what isn’t a hard game. The system of checkpoints is fairly forgiving, but there will be the odd time when you die and you’re transported halfway across the map, behind the six mobs of bad-guys you’ve already defeated. This can get extremely frustrating, as there’s often no way to progress until you’ve beaten every single enemy on the screen. The thing that brings the experience down the most is the copy-and-paste approach to level design. In just about every level, there’s an underground railway or some metal grating over a lava pit, or a bland industrial site. There’s an intense sense of déjà vu here, and it never really feels like you’re progressing. In contrast to the vibrant, loud, comic-book-inspired aliens you’re in control of, the world itself is depressingly bland and colourless. The outdoor sections feel oddly lonely: Alien, but not in a good way. The empty city streets are begging for a few extra details, like NPC’s fleeing from the giant ants that are crawling about. Omniverse is basic gaming in every sense, which isn’t to say that younger Ben 10 fans won’t enjoy the colourful characters, easy progression and co-operative play. Older gamers will tire of it quickly.